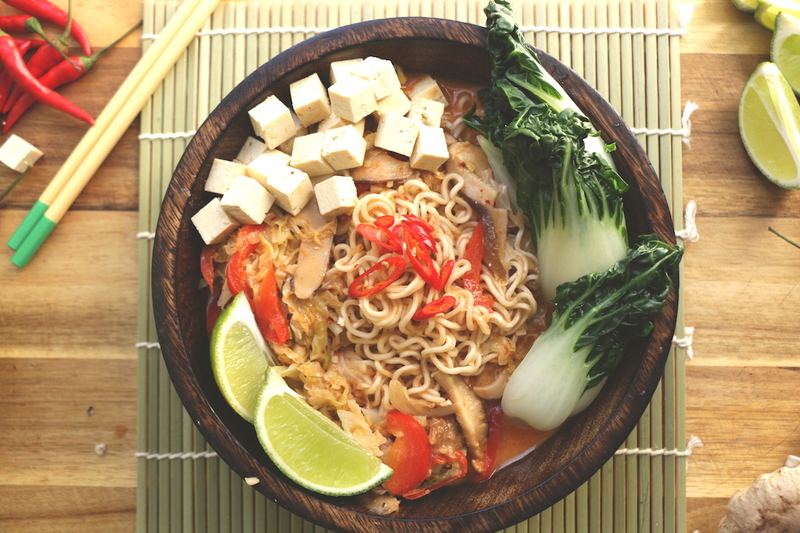 Completely loaded with veggies and flavor, this Thai Red Curry Ramen is easy, healthy and will become a new family favorite. Shiitake mushrooms give this healthy soup a real umami flavor boost. A vegan-friendly recipe that is packed with protein and Asian-inspired flavors. Soak the bok choy in boiling water for 3 minutes. Drain and reserve. In a saucepan, over high heat, sauté shallots, ginger, garlic, pepper, shiitake, cabbage in the oil until soft. Add the curry paste, cane sugar, coconut milk, vegetable broth. Bring to a boil, reduce the heat and simmer gently until the vegetables are cooked through, about 10 minutes. Add ramen noodles, tofu and bok choy . Add salt if necessary. (The amount of salt may vary depending on the vegetable broth used as well as the curry paste). I have just tried it and it tastes amazing! Thanks for your inspiring recipes!!! I assume that 3 bok choy means 3 spikes and not 3 bunches? Is there nutritional information for the recipe? It was delicious. I noticed that in the video, the veggies were sliced, and the recipe called for them to be minced. Which should it be? Thanks. Is red curry paste hot? My wife likes all curry type dishes mild. Yes, I agree with the previous comment. Put a shredded carrot in as didn’t have bok choy, tasted just as good. (fusion cooking!) Thanks for the recipe. Is the tofu uncooked? Just straight from the pack? Is the tofu uncooked straight out of the pack? Not sure why vegetable stock is needed it watered everything down. Had to substantially increase the spice level to get a decent flavor. The addition of fish sauce would definitely help the taste but being vegan I used a dash of cider vinegar which seemed a fairly ok substitute. Also I used Soba (buckwheat) noodles.